This year seasonal changes have happened very quickly. BAM! It’s summer. BAM! Now it’s fall. These quick shifts have made it very hard for me to adjust to each change. I don’t know what to wear, I don’t know how to dress my children for the day, and I don’t know what to make for dinner. My mind is all swimsuits and grill, but my body is sweaters and soup. It is confusing. The shift from hot to cold weather makes me crave rich flavorful foods, the kind that cook all day and fill the house with warm smells. One of my favorite fall dishes to make is Hot German Potato Salad. Not so much a salad as a hearty side, the flavors hit the spot but it can get kind of heavy. I decided to make some soup that contained the same kind of flavors found in the dish, but with less of a caloric commitment. I based the flavors on my very favorite version of this dish which can be found at Ruttger’s Bay Lake Lodge in Minnesota. It is thick, rich, and full of bacon and vinegar goodness. 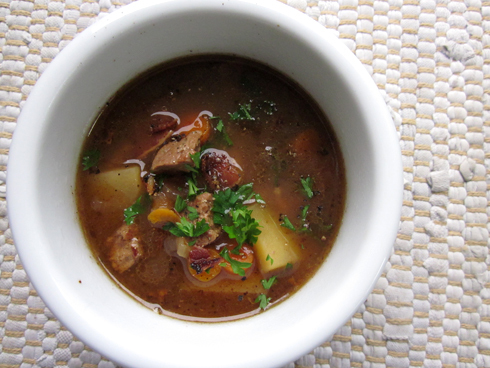 With that recipe in mind, I created a soup that is just as hearty and full of flavor, but comes in under 300 calories per serving. The recipe is easy to make and requires just a bit of prep, then a few hours in a crockpot to cook the potatoes and bring the flavor together. It makes a batch that is perfect for dinner with enough leftover for lunch the next day. This soup improves with age, and freezes very well. I would highly recommend this soup, and will definitely make it again. Place potatoes, carrots, and onion into a crockpot, turn to high. Add oil to a pan over medium-high heat. When oil is hot, add venison and cook until browned. Remove and place in crockpot. Add bacon to the pan, reduce heat then cook until bacon is crisp. Remove bacon and set aside on a paper towel. In a small bowl, combine the sugar, flour, celery salt and pepper. Add to the pan and stir for one minute until the flour mixture absorbs everything in the pan. Add 1/2 c. beef stock and 1/2 c. cider vinegar to the pan and stir until a thick sauce forms. When it starts to bubble, add the remaining stock and bring to a boil. Pour stock mixture into the crockpot. Crumble all of the bacon, add half to the crockpot. Cook for 4-5 hours on high. When ready to serve, ladle into bowls and top with bacon crumbles and fresh parsley. Oh wow, this looks great. I’ve not done any German food – I really really should. let me know if you give it a try – I’d love to hear what you think about the soup.